I’ve renamed the first weekend of October as Nerd Christmas. This is strictly due to one of my favorite annual events: New York Comic Con. Held at the Jacob Javits Convention Center, NYCC is quickly growing and will soon surpass SDCC as the largest North American comic convention. Here at the Dubbs, we go all out in our New York Comic Con coverage. 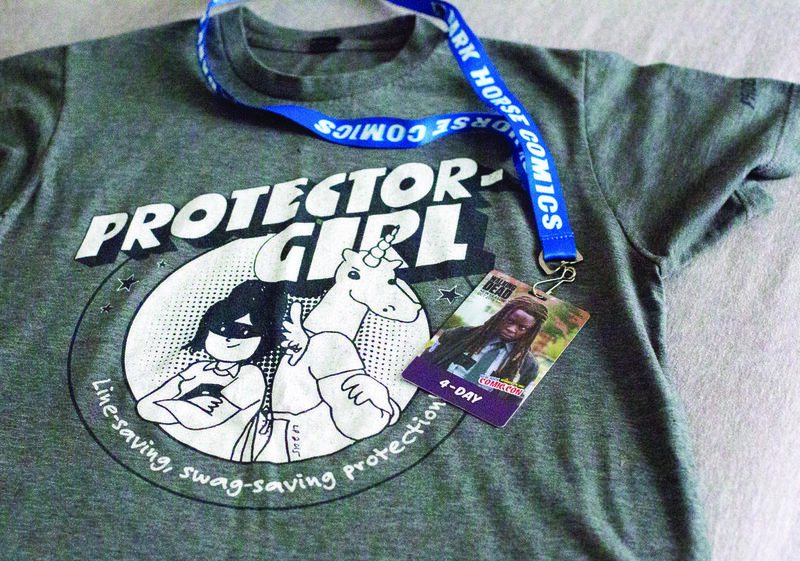 Cameras and 4-day passes in tow we cover the sights, sounds, cosplayers and swag (like the sweet Progressive Protector-Girl tee pictured above). This year’s con proved especially harrowing as we tried to bravely navigate the con with a newborn. Traversing the Javits Center floor is hard enough—imagine how challenging that is with a baby strapped to you! In the greatest feat of multitasking ever, Madeline shot the entirety of the show with a baby. While DC avoided the main floor (again) so they could have a larger footprint, Marvel dominated the Show Floor with their stage and the endless stream of Agents of Shield. The Block also seems to be growing larger and larger—even if it was harder to get to due to the largesse of the Funko lines. That is a phenomenon I definitely did not predict. When I wasn’t marveling at the amazing costumes or searching for exclusive Legos, I was totally geeking out over meeting my favorite creators and getting to ask them what inspires their work or who their favorite characters are. Amy Reeder and Dustin Nguyen were two of my favorites to converse with this year. Jim Lee once again had the largest lines of any creator. Marty McFly is supposed to arrive in the future on Oct. 21, 2015, where he drinks Pepsi Perfect. Sadly, I did not see any Back to the Future Pepsi bottles. Needless to say, if you ever want to fully celebrate Nerd Christmas, make your way to New York in early October and come experience the sights at NYCC.